Robby the Robot, Forbidden Planet – $5.375 million (2017) – This seven-foot-tall robot from the 1956 is considered the most expensive movie prop ever auctioned. The lot also included a Jeep Robby drove on the planet Altair IV, an auxiliary control panel, and original packing crates from MGM. Marilyn Monroe’s white dress, The Seven-Year Itch – $4.6 million (2011) – The famous scene where an updraft from a subway grate blows up Marilyn Monroe’s skirt made this dress one of the most instantly recognizable costumes in movie history. The final auction price vastly exceeded the $2 million expected. James Bond’s Aston Martin, Goldfinger and Thunderball – $4.6 million (2010) – An Ohio collector purchased this 1964 Aston Martin DB5, which was one of two cars driven by Sean Connery as the famed spy 007. The other car used in the films was reported stolen in 1997. Maltese falcon statue, The Maltese Falcon – $4.1 million (2013) – Although two identical statues were made for use in the film, the filmmaker verified that this one was the statue that actually appeared on screen. Upright piano, Casablanca – $3.4 million (2014) – At Rick’s Café Americain in Casablanca, Sam played the song “As Time Goes By,” the unforgettable leitmotif of the movie, on this piano, making it one of the most famous pianos in the world. It was modified for the movie so that Rick could open the lid from the rear to hide important papers. Cowardly lion costume, The Wizard of Oz – $3 million (2014) – The original costume worn by Bert Lahr as one of Dorothy’s companions in her journey down the yellow brick road had been left in an old MGM building before it was rescued by a junk dealer and subsequently auctioned off. Costumes worn for “Do-Re-Mi,” The Sound of Music – $1.56 million (2013) – The costumes worn by the Von Trapp children and by Maria (Julie Andrews) in the scene where she first teaches them to sing sold in a lot including other costumes from this beloved musical in a Hollywood auction. Unfortunately, as with other kinds of memorabilia where prices are high and authenticity is key, movie memorabilia can attract counterfeiters or invite misrepresentation. Recently two movie props slated to go up for auction—a lightsaber purportedly used by Mark Hamill in the filming of Star Wars: A New Hope and a Walther pistol that supposedly appeared in the opening scenes of the 1962 James Bond film Dr. No—were withdrawn due to disputes over their authenticity. Collectors interested in purchasing any kind of memorabilia should be careful to purchase only from scrupulous dealers who will guarantee the provenance of the items they sell. 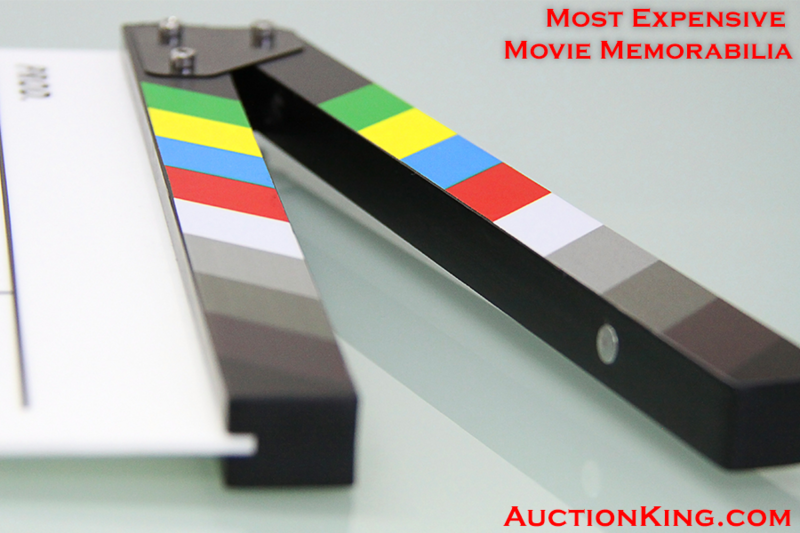 At AuctionKing.com, our clients find great values on memorabilia and collectibles every day. We triple-check the authenticity of every item so that you can bid with confidence. Our secure bidding platform gives you the excitement of live bidding with the convenience of online shopping. To start bidding and start winning, register for a free online account today.